What are vertical line segments? Which data formats support vertical line segments? Which tools support vertical line segments? What can I expect when using data with vertical line segments with a geoprocessing tool? Which tools are known to strip, flatten, or remove vertical line segments? Starting in ArcGIS 10, z-aware polyline features can contain vertical line segments. These features containing vertical segments must be stored in an ArcGIS 10 or later version geodatabase; any vertical segments in a feature stored in a previous version geodatabase or other geodata format are stripped or flattened. Some geoprocessing tools support vertical line segments and preserve these segments in the tool output, while other tools strip or flatten any vertical segments. A vertical line segment is a portion of a line that is entirely vertical; that is, both vertices that make up the segment's endpoints have the same x- and y-coordinates but different z-coordinates. Vertical line segments may be individual features, or they may be contained in features that have other segments that are nonvertical, composing a hybrid polyline. In the graphic above, the orange feature on the left represents an individual polyline feature that is composed of a vertical segment. The black dot beneath the feature shows how this vertical polyline would be represented in 2D (remember that the x- and y-coordinates for both segment endpoints are the same, so in 2D, the vertical line only appears as a point). 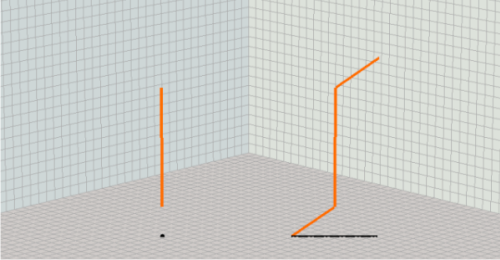 In the graphic above, the orange feature on the right represents a hybrid polyline feature where one segment of the line is vertical but other line segments are horizontal or sloping (nonvertical). The black line beneath this feature shows how this hybrid polyline would be represented in 2D. Vertical line segments can only be contained in polyline features within an ArcGIS 10 or later version geodatabase. This includes personal, file, and ArcSDE geodatabases. To upgrade your geodatabase to the latest version that supports vertical line segments, use the Upgrade Geodatabase geoprocessing tool. Previous version geodatabases, as well as other geodata formats such as shapefiles, do not support vertical line segments. Except for the special cases indicated below, you can expect that if the input data has vertical line segments, the tool output will maintain these vertical line segments (limited to the tools indicated above in the section "Which tools support vertical line segments?"). Buffer: Only a buffer operation with a Dissolve Type of NONE works with vertical line segments. The output buffer polygon is placed at the base height of any vertical line segments. Optional parameter settings Side Type and End Type are respected when generating buffers for hybrid polyline features. Overlay tools like Intersect and Union, which planarize feature geometries, flatten vertical line segments (see the tool help for more information about what the respective tool does to feature geometries). Tools that aggregate and combine feature geometries, like Dissolve, may also flatten vertical line segments. Tools that convert between geometry types, such as Feature To Line, may also flatten vertical line segments.